KNAC.COM - Reviews - TESLA Live In Anaheim, California With Photos! TESLA Live In Anaheim, California With Photos! 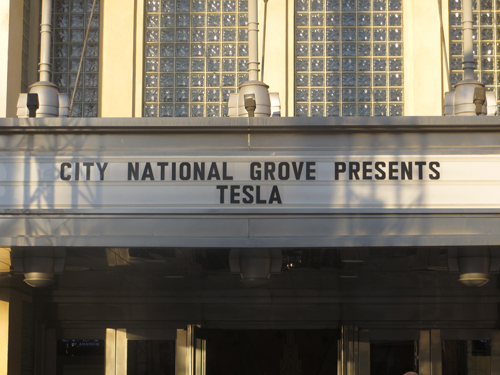 Sacramento California based rockers TESLA made their way through southern California recently, and I checked out their Anaheim show. For those that have never been, the "City National Grove Of Anaheim" or "The Grove" as it's known locally, is a 1000 capacity showroom, located right next door to Angel Stadium, home to the Los Angeles Angels major league baseball team. It's booked by LA based Nederlander Concerts, and it's a great place to see a show. Terrific sound and lights, a great staff, and lots of room to move about, as well as a "tiered sightline" so that you can get a great look at what's happening on the huge stage. And happening tonight, was a good old-fashioned rock show, by a band that has been around quite awhile, broken up, resurrected, and now re-energized with a brand new release Simplicity to promote. And they wasted no time doing so, opening with "MP3", a track off that record, that is all about social and technological change in the digital age. 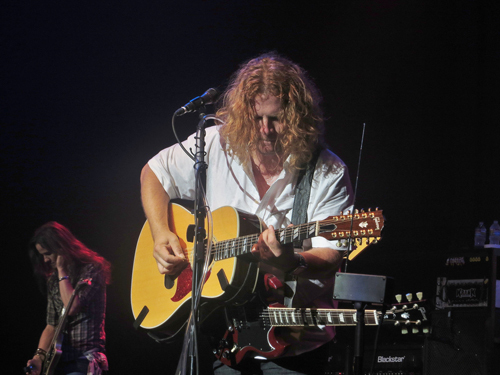 Guitarist Frank Hannon, sporting a "double neck" guitar and using a theremin, brought to mind shades of Jimmy Page from LED ZEPPELIN, with his blistering lead guitar riffs, and ample use of the unique sounds coming from the theremin. The following few songs were a great mix of the old and new with "Edison's Medicine" from 1989, and "I Wanna Live" from 2008's Forever More release. Singer Jeff Keith, still looking exactly the same as he did in the 1980's, addressed the crowd, and exclaimed "Can you believe this band has been together 27 years?" They then launched into "Hang Tough", another from 1989's Great Radio Controversy and the "old school" TESLA fans sang every word. Again the band dipped into one of 4 new songs from Simplicity. "So Divine" is the lead single off that release and it's guitar intro, which reminds me of the AEROSMITH classic "Seasons Of Wither", just pulls you into the song. And it went over well with the crowd. These days, it is a rarity for many touring bands, to stray from the tried and true hits which makes it so impressive that this band had the balls to play 4 songs from their latest in a 16 song set. TESLA has not strayed too far from their original formula of no-frills, straight ahead rock, so the new songs fit right in. But again, TESLA's catalogue of songs is very impressive indeed. They just kept pulling them out from various points in their career and rocking them, much to the sold-out crowds delight. 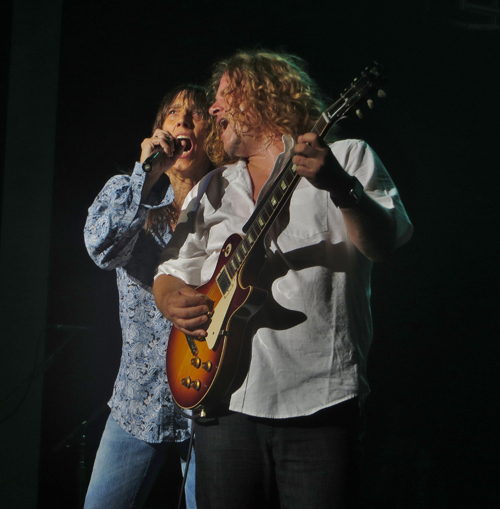 "Heaven's Trail (No Way Out)", spotlighted great interplay between guitarist Hannon and Dave Rude. "Mama's Fool", from 1994's Bust A Nut release, turned into a down home sing-along. "The Way It Is", again from 1989, had Jeff Keith dancing around the stage like a dancer at a mid-70's GRATEFUL DEAD concert, all the while singing in the original key, which is hard to do. "Life Is A River" from Simplicity featured bassist Brian Wheat on electric piano, and it's mellow vibe brought to mind, again, any number of 1970's singer-songwriter era classics, ala Carole King, Elton John or 1980's AEROSMITH. Just a feel good number, and went over well with the crowd. I was told this may be released as a single in the near future. 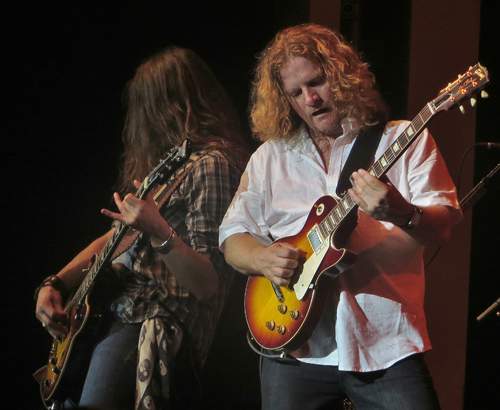 Again, the band dipped into Simplicity, and another great retro sounding tune "Burnout To Fade" was performed, for the first time ever onstage, according to Frank Hannon. Soon the Grove was a sea of cell phones, all filming the band performing the song with the swaying beat. Here's an actual YouTube video filmed from this very show - http://youtu.be/R-wJ_j3k9DY. Have I said how much I like this album? "What You Give" from 1991's Psychotic Supper release was a surprise, but again, not really, given the way that most of the set was performed. What was NOT a surprise was the following "Signs", from their 1990 Five Man Acoustical Jam, the forerunner of the wildly popular Unplugged series on MTV, when they actually played video's and live performances from bands. Remember that? And, I just have to clarify, this is a COVER song, originally done by the FIVE MAN ELECTRICAL BAND in 1971. Anyway, TESLA resurrected the song, the crowd loves it, and it has become a standard in their sets for years. Out came the acoustic guitars, and there was some fine interplay, once again, from Frank Hannon and Dave Rude. A little acoustic guitar jamming, that eventually led into the big hit ballad "Love Song" from 1989. A huge crescendo and applause followed, and Jeff Keith again thanked and addressed the crowd. "Do ya wanna hear something from our first album?" he asked, knowingly. What the band then did was finish the set with three from that killer debut, 1986's Mechanical Resonance. Has it really been that long? "Gettin' Better" led to drummer Troy Lukketta's great drum accents on "Modern Day Cowboy". It seemed like an airplane was taking off inside the Grove as the crowd sang the words "Bang bang, shoot em' up", during that one. The evening finally finished off with their first hit, (another cover song from the British band Ph.D, in case you didn't know...) "Little Suzi". Again the crowd loved every moment. The band looked pleased in their triumphant return to Southern California, and all had a good time, which is what should happen at any rock show, but unfortunately, does not with many bands that have been around as long as TESLA has. I highly recommend their latest CD Simplicity. Every song on it is a great listen, and if you enjoy feeling good while listening to an retro sounding, collection of finely crafted songs, written and recorded by a great bunch of guys, who really bring it to you when you see them in concert, then this is the 2014 release for you. Go to www.teslatheband.com for more info and tour dates. "Cumin' Atcha' Live" to a town near you. Don't miss them.